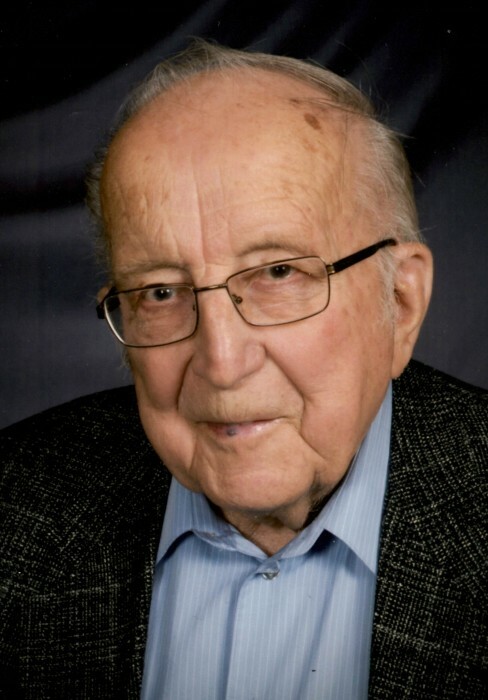 William “Bill” Bullinger, 92, of Mandan, passed away January 22, 2019 at Sunset – a prospera Community, Mandan. Mass of Christian Burial will be held at 10:00 AM on Saturday, January 26, 2019 at St. Joseph Catholic Church, Mandan, ND with Rev. Jarad Wolf as celebrant. Burial will be at Mandan Union Cemetery. Visitation will be held Friday from 5:00-8:00 PM at Weigel Funeral Home, Mandan with a Rosary/Parish Vigil at 7:00 PM. Visitation will continue at the church one hour prior to the service on Saturday. Bill was born on January 1, 1927 to Jacob and Mariann (Leingang) Bullinger in St. Anthony, ND. He was raised and educated at St. Anthony Grade School. On March 1, 1949, he married the love of his life, Florence Birkholz at St. Joseph Catholic Church, Mandan. He then began working for the railroad. Later he worked for the Mandan Creamery and Cloverdale before ICI in Beulah, Center and Underwood. Before retiring he worked as a janitor for Electrical IBEW Union in Bismarck. Bill will be remembered by so many whose lives he touched with his gentle warmth and kindness. Games were great fun as he would enjoy a good card game of blitz and smear; or he’d invite you to sit down and watch a game of Wheel of Fortune with him. Having an ear for music, he would dance the nights away at Joe's bar; and played the accordion and organ by ear without ever taking a lesson! Being the artistic man he was, he loved to draw, especially farm animals. He was an amazing family man who loved his family dearly and most could not measure up to him. Bill will be lovingly remembered and sadly missed by his loving wife of 69 years, Florence; children, Charles (Lucinda) of Bismarck, Harlan (Cheryl) of Grand Junction, CO, Kenan of Bismarck, Karla (Tom) Hellman, and Kimberly (David) Schulz, both of Mandan; 7 grandchildren; and 12 great grandchildren. He was preceded in death by his parents; his son, Mark; 4 brothers; and 12 sisters. The family would like to give a heartfelt thank you to the Sunset Prospera and CHI St. Alexius staff. Go to the Tribute Wall to sign the online guestbook and share memories with Bill’s family.